The San Diego Chargers took their fans on a weird football odyssey last year. In 2010, NFL had some strange twists but do you realize that the Chargers finished #1 in offense AND defense yet finished 9-7 and missed the playoffs?? The last two times we at Taylor Blitz Times can remember that happening was in 1977 when the 12-2 Dallas Cowboys won it all, and the ’87 San Francisco 49ers who were 13-2 and should have won it. When a team plays up and down to the level of their competition its suffering from a lack of leadership. Direct reflection of Norv Turner who should have been let go for having that much talent & not make the playoffs. Its evident that they played to the level of their competition and weren’t motivated to do away with the lesser teams. How do you improve on having the best offense and defense in the NFL? 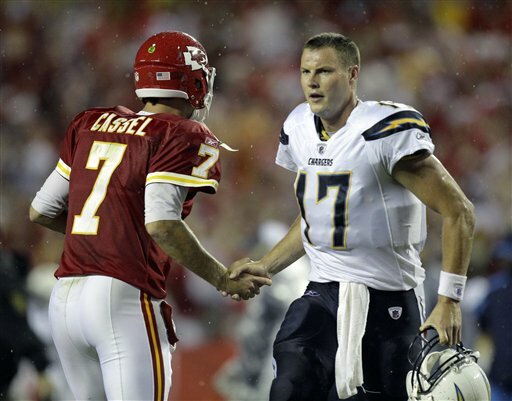 How does a team with the second rated passer in Phillip Rivers sit at home in January? The Chargers were the 2nd highest scoring team and gave up the 10th fewest points in the NFL. These numbers and rankings just aren’t adding up. There has to be a change in the culture of this football team for its psyche is a little off, yet where would you tinker as to not upset the production of the team? Norv Turner is definitely on the hot seat this year and throughout his head coaching career his leadership qualities have always been in question. He’s shed some of that over the last few years with a trip to the ’07 AFC Championship Game but the team has had enigmatic season endings ever since. So those allegations are resurfacing. Quarterback: Its sometimes strange in how media covers certain players or why fans don’t readily accept them. Phillip Rivers is on the flip side of the great trade for Eli Manning and is best known for his verbal skirmishes with Jay Cutler when he was a Denver Bronco. From time to time you see him in the face of a defender if he feels he was hit late and gets into it with opponents verbally. To us thats moxie, hutzpah, the type of fire from within that Dallas Cowboy fans would like to see from Tony Romo. So why is it that Rivers public persona takes a hit for this side of his personality?? When they talk of the NFL’s best quarterbacks his name rarely comes up. Take a look at what he did last year; 357 of 541 for 4,710 yards and 30TDs with 13 int. Yikes folks those are Dan Fouts numbers!! He was the 2nd highest rated quarterback, led the NFL in passing yards and his touchdown total ranked 5th. Do you realize he also led the NFL with 65 pass plays last year that gained over 20 yards?? He was named to his 3rd Pro Bowl, this time as a starter so maybe perceptions are starting to change. 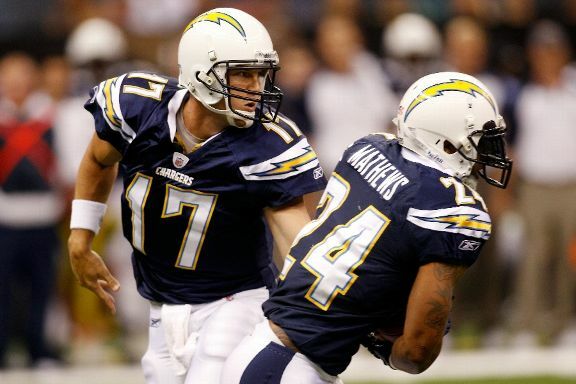 Entering his 8th season Rivers is in his prime and playing some great football. He’s averaged nearly 31 touchdowns over the last three seasons and seems to be getting better with age. The natural tendency is to gauge his success with that of his 2004 draft counterparts Eli Manning and Ben Roethlisberger. Now each of them have Super Bowl rings, so that has become the measuring stick for him to be graded by. As a quarterback he has performed better than the both of his counterparts but without the hardware, he has to get his ring before he’s going to get his due. May not be fair but perception is reality. He earned his courage badge forever when he limped one legged through the playoffs to the AFC Championship with a torn knee ligament in 2007. It might be high time for Rivers to take on more of a leadership role yet what he has to have his team avoid falling behind and having to try and rally the Chargers in every game. He is a Super Bowl quality quarterback who might be just one year away from winning his. Offensive Backfield: It took a year for everything to roll over but the Chargers learned that there is life after Ladainian Tomlinson. After a year in which the Chargers found out the hard way that Darren Sproles was only a 3rd down back, they drafted Ryan Matthews from Fresno State. Last year he teamed with 243lb. butterball ex fullback Mike Tolbert, to form a formidable rushing attack. Tolbert led the team with 735 yards rushing with 11 TDs, while Matthews ran for 678 yards and 7 TDs despite missing 4 games. This year look for Matthews to go over 1,000 yards for the first time in his career. He runs with power yet has more wiggle than Tolbert and can turn vicious shots into glancing blows. We expect him to take on the featured role and have Tolbert’s carries diminish in 2011. Now do we expect Matthews to duplicate the 1400 yards and 18 touchdowns that he and Tolbert combined for?? He’s going to come close. We expect a 1,200 yard 13 TD season this year. Out of the backfield on 3rd down is where Darren Sproles was best utilized. Last year he gathered in 59 receptions for 520 yards and 2TDs. Matthews and Tolbert combined for 47 receptions and another 361 yards out of the backfield. By the time we put in FB Jacob Hester, this team can run out of any formation with either power or speed and should try some Power-I formations to cut down on penalties and take control of the line of scrimmage early in ball games. They have 3rd down speed to get after linebackers and cause the mismatches that Sproles can turn into first downs. This team is set at running back and Tolbert can take over when Matthews needs a rest or is injured. Both are young with Matthews in his 2nd year and Tolbert entering his 4th. They also drafted Jordan Todman out of UConn for insurance. At running back this team is playoff caliber as a committee. They have the breakout year from Matthews that we’re expecting and they could be Super Bowl quality. Receivers: When you stop to think that between Vincent Jackson and Antonio Gates, there were a combined 17 games missed in 2010. Despite that the Chargers still finished with over 4,700 yards through the air?? Yikes! Even though he missed 6 games, Gates still made the Pro Bowl after a 50 catch season & scoring 10 TDs. Once again his yards per reception average ranked up there with those of an outside receiver at 15.6. However at 30, has he hit the wall when it comes to completing a full 16 game season? He has been durable in the past in not missing games but he has been on the injury report a bunch with turf toe and ankle sprains over the last 3 years. After 8 seasons as the main “go to guy”, the last 7 with Pro Bowl distinction, has the pounding started to take its toll on Gates?? Keep an eye on this. Receiving by committee was what the Chargers went through without their best wideout in Vincent Jackson. Emerging from the pack was Malcolm Floyd, who snagged 37 catches for 717 yards and 6 TDs. 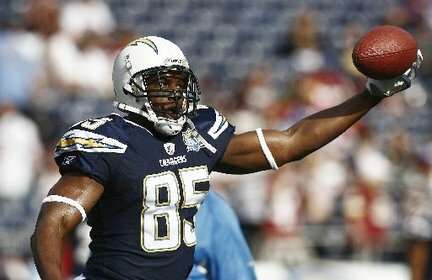 With Jackson healthy, maybe the Chargers don’t need that other big time receiver as many pundits think they do. However they took a flyer on hometown product Vincent Brown, a 5-11, 187 lbs. with a 3rd round pick. He is shiftier than the taller, more stiff receivers in Nanee and Floyd who are straight line route runners. If Brown comes in and contributes this could reduce playing time for former Cowboy Patrick Crayton. 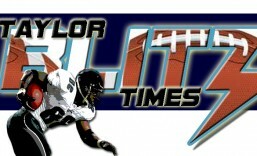 In 2011 Crayton was 4th on the team with 28 catches for 514 yards yet only produced 1 TD. The Chargers need just a little more explosion out of the slot position and Brown could be that guy. Vincent Jackson’s return is important to the Chargers maintaining mismatches in the passing game. At 6’5, 241 lbs. Jackson is a huge receiver who can muscle most corners. Add to that a 6’5, Floyd and a 6’3 Legedu Naanee and you have a receiving corp that causes serious physical mismatches in speed against linebackers in the nickle or smaller DBs to cover them. Along with Gates this is a near Super Bowl caliber group. Offensive Line: An individual source of issues can be seen with this offensive line. Although they were number one in total offense, some deficiencies show up here. However we have to remember San Diego is a passing team or at least they’re perceived to be since they were always scrambling from behind last year. 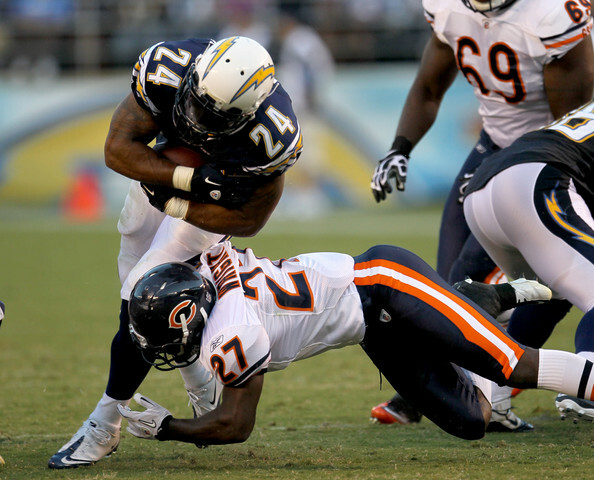 The Chargers were 15th in NFL rushing with 1,810 yards and their 18 TDs ranked 4th. In 2010, the offensive line did have 12 missed starts mainly at LT and RG due to injury yet the offensive line at RT was manned all season by Jeromey Clary. They drafted Steve Schilling , a guard from Michigan to compete for the RG spot. However when this team ran the football to the strong side, they only produced 22 rushing first downs and on 3rd and shorts/goal line were only successful 45 times. These numbers ranked 30th and 24th respectively. That has to get better so this team can run out the clock and win more games. Defensive Line: Where everyone has been talking about the defenses in Pittsburgh and Green Bay yet this was the number one defense in all of football. This line was the impetus for the Chargers being 4th in the NFL against the run, allowing opponents only 3.7 yards per carry. 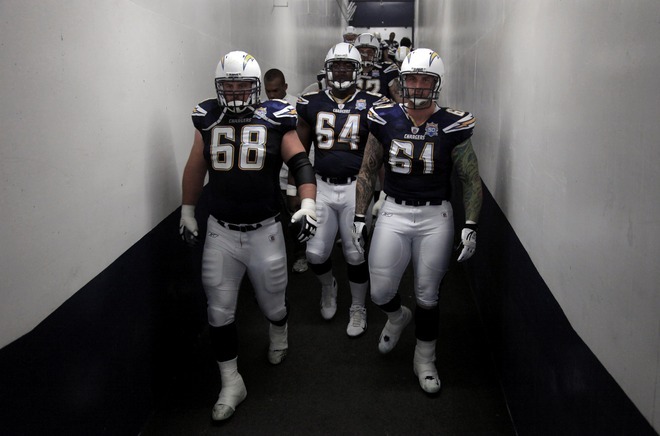 Add to that the very first pick was on DT/DE Corey Liuget from Illinois, whom “Bolts From The Blue” believes will replace Jacques Cesaire at LDE.http://www.boltsfromtheblue.com/2011/4/30/2145940/2011-nfl-draft-san-diego-chargers-selections That may have been true before the lockout but if Liuget starts slow he’ll at least provide some serious depth. Aside from a lack of consistency in his pass rushing (1.5 sacks) we would have a hard time replacing him unless he was clearly outplayed in the pre season. RE Luis Castillo and NT Antonio Garay hold ground against the run as well as Keisel and Hampton in Pittsburgh. Garay also pitched in with 5.5 sacks which is hard to do facing double and triple teams on the point. On paper this is another above average unit the Chargers field. If they can produce a few more sacks lookout. Charger linebackers getting fired up!! Linebacker: Shaun Phillips again went to the Pro Bowl after a solid season. His 55 total tackles was low but his impact was felt elsewhere with his 11 sacks, 7 passes defensed and 1 interception. Almost 20 times forcing a turnover or a punt is tremendous from one defender. The surprise campaign was turned in by inside ‘backer Kevin Burnett formerly of Dallas. He may have been robbed of a Pro Bowl season after a 95 tackle, 6 sack, 2 interception performance. Both Burnett and Phillips returned an interception for a touchdown in 2010. Each are primed to duplicate those performances the first issue is to retain Burnett’s services since he’s a free agent. As for Stephen Cooper at the other inside linebacker spot, he will be challenged by Jonas Mouton out of Michigan who was selected in the second round. What is surprising is that there was actually someone on the Michigan football team that could tackle last year?? We didn’t see it but we didn’t watch every game either. Our apologies this was an insurance move that was necessary but we see it playing out that Cooper will start early and then be replaced if Mouton can pick up the defensive sets and calls. Last year Cooper accounted for 44 tackles in 12 games with 1 sack and an interception. Since he will turn 32 this year his production doesn’t merit what his tenure says he should be paid under the current collective bargaining agreement. This team is still reeling from the loss of Shawne Merriman. He was their spiritual leader as much as a vocal one and his replacement Antwan Applewhite is serviceable but not the playmaker Merriman was. Alright we’re a little harsh but he did record 46 tackles and 3 sacks in the 13 games he replaced Merriman. At times he could be fooled but you have to attribute that to a lack of experience and he should be less stiff in his play this year. At 26 years of age Applewhite should be in his prime, the question is will they call for him to make the plays they used to ask of Merriman? Linebacker on this team is slightly above average with a chance to be really good if Mouton shows up ready to play and Applewhite improves with his play recognition. Secondary: How is this team going to play at the corner with the loss of Cromartie? Remember that question before last season? Quite well thank you. His replacement Antoine Cason had 67 tackles, 17 passes defensed and 4 interceptions along with a forced fumble in a solid all around performance. He outperformed his counterpart Quentin Jammer who had 45 tackles, 11 passes defensed with 2 interceptions. Understand that this team was #1 against the pass and was the only NFL team to allow less than 3,000 yards passing for the season. These corners are beyond solid. By the time we make it back to the safeties, Eric Weddle (FS) and Paul Oliver (SS) you have two guys are who are willing to tackle. Weddle was second on the team with 95 tackles. On a team that produced 47 sacks and a lot of pressure you’d think that the safeties would have more interceptions than the 2 Weddle produced and 1 for Oliver. Yet being the last line of defense they will step up and hit you that much we do know. As a secondary this is a near Super Bowl caliber secondary based on the corners. This might be the best corner tandem in football, rivaling that of Revis and Cromartie in New York. Overall: Something is missing from this football team and it starts at the top when it comes to motivation. This team starts too many games slow and then come roaring back only to fall short. In losses last year to the Patriots, Raiders, Bengals, and Rams it was the same thing over and over. The Chargers either didn’t score in the first quarter or first half and then scored in a mad scramble at the end of the game. This team lacks urgency and reminds us of the situation in Tampa right before Gruden took over. We think Norv Turner has taken this team as far as he could take it and the next coach may put them in the Super Bowl. There is just no way Turner can survive not making the playoffs again with this much talent on the roster. This team might want to take a page from the Buffalo Bills in 1989 to squash their slow starts. Since they’re so proficient at the hurry up offense, start the game with it to put their opponents on their heels a bit. If this team can get a lead they’re super dangerous. In 8 of their 9 wins, this team scored over 30 points averaging 34 points per game. This is a Super Bowl champion in waiting. 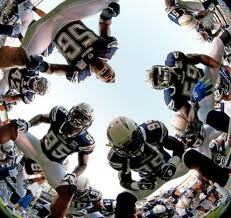 2012 may be their year the question is will Norv Turner still be there. This is the best team in the AFC on paper but they will frustrate their fans again this year. This entry was posted in 2011 Team Previews and tagged football, football predictions, NFL, nfl football, NFL Previews, Norv Turner, Phillip Rivers, pro football, Ryan Matthews, San Diego Chargers. Bookmark the permalink. Nice write-up even though I hate the Chargers. Keep it coming Jeff. Raiders for life, Just win baby! Great team that didnt make the playoffs with the number 1 offense and defense last year. I look for them to have a top 5 both sides of the ball this year again. I see a Cowboys vs Chargers match up in the Superbowl within 2 years.